On this date in 1532 the conquistador Francisco Pizarro and 169 men (mostly soldiers) arrived in Cajamarca on the invitation of the Inca leader Atahualpa. A black day for the Inca. Atahualpa camped outside Cajamarca with an army of around 80,000 Inca and met Pizarro the following day. Atahualpa assumed, quite mistakenly, that his army of 80,000 had nothing to fear from 170 Spaniards. Shows how wrong you can be. For Atahualpa it was a fatal mistake, costing him his life and the independence of the Inca people. The conquest of South America by Pizarro and later generals, and of Mesoamerica by Hernán Cortés and those who came after him, are enduring lessons of history. In the Old World, for centuries, massive armies pitted against one another for supremacy as empires rose and fell, but in the New World the all-powerful Inca and Aztec empires were toppled by a handful of men. How could this possibly have happened? One, over-simple, answer is that powerful empires can be conquered if they have internal divisions. The Inca and Aztec empires certainly were rife with internal power struggles at the time of the Spanish conquest. Both Pizarro and Cortés were astute in taking advantages of these rifts in the empires, and were treacherous into the bargain. Trusting their word was a big mistake. Having guns and horses was symbolically very important to the Spanish, but could not have tipped the balance in their grossly uneven contests. If you saw an army of 169, armed with guns, against one of 80,000, armed with spears and arrows, who would you bet on? I’d go with sheer numbers any day. In January 1531, a Spanish expedition led by Francisco Pizarro, on a mission to conquer the Inca Empire, landed on Puná Island. Pizarro brought with him 169 men and 69 horses. The Spaniards headed south and occupied Tumbes, where they heard about the civil war that Atahualpa and his half-brother, Huáscar, were waging against each other. In September 1532, after reinforcements arrived from Spain, Pizarro founded the city of San Miguel de Piura, and then marched towards the heart of the Inca Empire, with a force of 106 foot-soldiers and 62 horsemen. 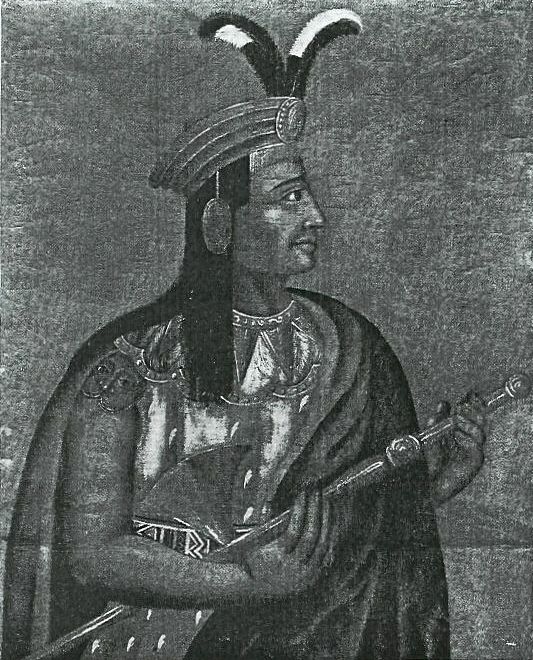 Atahualpa, in Cajamarca with his army of 80,000 troops, heard that this party of strangers was advancing into the empire, and sent an Inca noble to investigate. The noble stayed for two days in the Spanish camp, making an assessment of the Spaniards’ weapons and horses. Atahualpa decided that 168 Spaniards were not a threat to him and his 80,000 troops, so he sent word inviting them to visit Cajamarca and meet him, expecting to capture them. Pizarro and his men thus advanced unopposed through some very difficult terrain. They arrived at Cajamarca on 15 November 1532. Atahualpa and his army had camped on a hill just outside Cajamarca. He was staying in a building close to the Konoj hot springs, while his soldiers were in tents set up around him. When Pizarro arrived in Cajamarca, the town was mostly empty except for a few hundred acllas (sequestered virgins). The Spaniards were billeted in long buildings on the main plaza, and Pizarro sent an embassy to the Inca, led by Hernando de Soto. The group consisted of 15 horsemen and an interpreter; shortly thereafter de Soto sent 20 more horsemen as reinforcements in case of an Inca attack. These were led by his brother, Hernando Pizarro. The Spaniards invited Atahualpa to visit Cajamarca to meet Pizarro, which he resolved to do the following day. Meanwhile, Pizarro was preparing an ambush to trap the him. While the Spanish cavalry and infantry occupied three long buildings around the plaza, some musketeers and four pieces of artillery were located in a stone structure in the middle of the square. The plan was to persuade Atahualpa to submit to the authority of the Spaniards and, if this failed, there were two options: a surprise attack, if success seemed possible, or to keep up a friendly stance if the Inca forces appeared too powerful. He [Atahualpa] was very drunk from what he had imbibed in the [thermal] baths before leaving as well as what he had taken during the many stops on the road. In each of them he had drunk well. And even there on his litter he requested drink. The Inca found no Spaniards in the plaza, as they were all inside the buildings. The only man to emerge was the Dominican friar Vincente de Valverde with an interpreter. Although there are different accounts as to what Valverde said, most agree that he invited Atahualpa to come inside to talk and dine with Pizarro. Atahualpa instead demanded the return of everything the Spaniards had taken since they landed. According to eyewitness accounts, Valverde spoke about the Catholic religion but did not deliver the official requerimiento, a speech requiring the listener to submit to the authority of the Spanish Crown and accept the Christian faith, as ordained by the Spanish Crown in 1513. This was actually a formal responsibility that would have excused Pizarro’s subsequent actions in the eyes of the Spanish government and the Catholic church if Atahualpa refused to submit. At Atahualpa’s request, Valverde gave him his breviary but, after a brief examination, he threw it to the ground. Valverde hurried back toward Pizarro, calling on the Spaniards to attack. At that moment, Pizarro gave the signal; the Spanish infantry and cavalry came out of their hiding places and charged the unsuspecting Inca retinue, killing a great number while the rest fled in panic. Pizarro led the charge on Atahualpa, but captured him only after killing all those carrying him and turning over his litter. Not a single Spanish soldier was killed. On 17 November the Spaniards sacked the Inca army camp, in which they found great treasures of gold, silver, and emeralds. Noticing their lust for precious metals, Atahualpa offered to fill a large room about 22 feet (6.7 m) long and 17 feet (5.2 m) wide up to a height of 8 feet (2.4 m) once with gold and twice with silver within two months. It is commonly believed that Atahualpa offered this ransom to regain his freedom, but he may have made the offer thinking it would save his life. None of the early chroniclers mentions any commitment by the Spaniards to free Atahualpa once the valuables were delivered. After several months in fear of an imminent attack from general Rumiñahui, the outnumbered Spanish considered Atahualpa to be too much of a liability and decided to execute him. 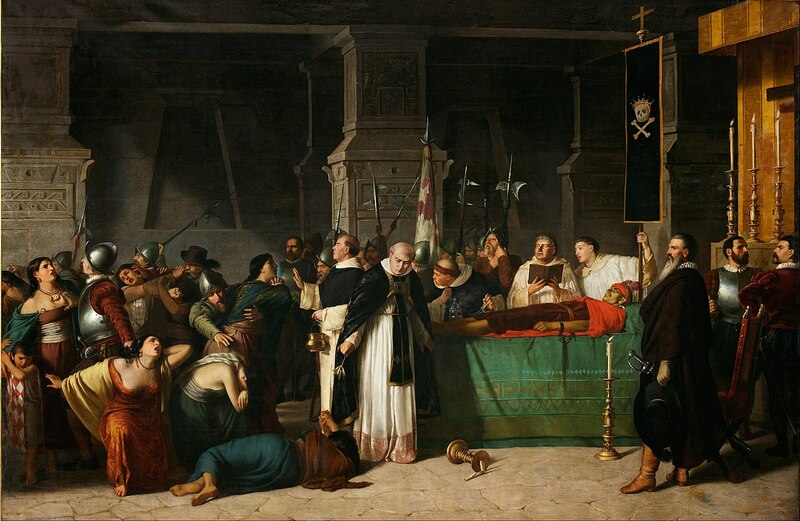 Pizarro staged a mock trial and found Atahualpa guilty of revolting against the Spanish (which was a fake accusation in the absence of the requerimiento), practicing idolatry, and murdering Huáscar, his half-brother. Atahualpa was sentenced to execution by burning. He was horrified, since the Inca believed that the soul would not be able to go on to the afterlife if the body were burned. Friar Vincente de Valverde, who had earlier offered his breviary to Atahualpa, intervened, telling Atahualpa that, if he agreed to convert to Catholicism, the friar could convince Pizarro to commute the sentence. 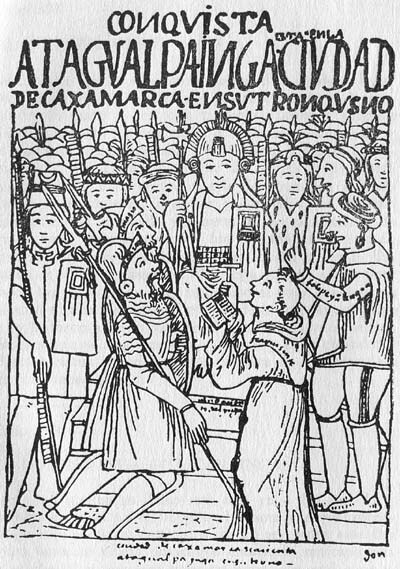 Atahualpa agreed to be baptized into the Catholic faith. 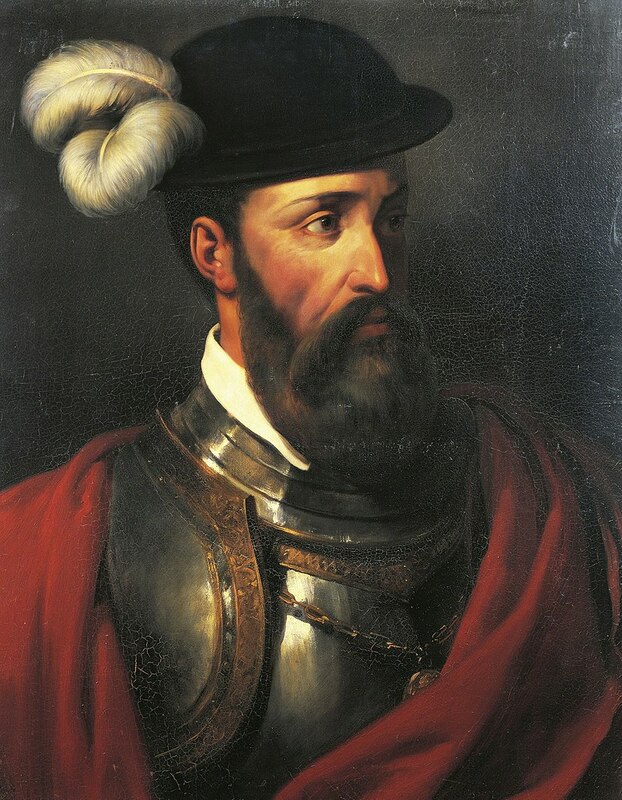 He was given the name Francisco Atahualpa in honor of Francisco Pizarro. In accordance with his request, he was executed by strangling with a garrote on 26 July 1533. At 1:30 a.m. on 26 July 1533, Atahualpa was interrogated before his death by his Spanish captors about his birthplace. Atahualpa verbally declared that his birthplace is in what the Incas called the Kingdom of Quito, in a place called Caranqui (today located 2 km southeast of Ibarra, Ecuador). Most chroniclers suggest that Atahualpa was born in what the Incas used to call the Kingdom of Quito, though other stories suggest various other birthplaces. When questioned about his age Atahualpa answered, “We do not use this western way of calculating time; but I can tell you that my life has seen 31 harvests since I was born, thanks to my mother’s help in telling me of my beginnings.” Following his execution, his clothes and some of his skin were burned, and his remains were given a Christian burial. Atahualpa was succeeded by his brother, Túpac Huallpa, and later by another brother Manco Inca. The independence of the Inca was, however, for all intents and purposes over although there were still many battles in the future. Pachamanca is an Inca dish with a long history that predates the Spanish conquest, but a version of it is made to this day with updated ingredients. I’ll give you a video on how it’s made traditionally, followed by a recipe using a home kitchen. The traditional recipe requires baking the meat and vegetables in a pit in the ground using heated rocks. This method yields incomparable results, but isn’t practical for the average household. Still if you want to give it a shot here’s the method. The commentary is in Spanish, but it’s not necessary to understand it. The recipe that follows fills in the details. The word “pachamanca” comes from Quechua pacha “earth” and manka “pot” (that is, the ground is your cooking pot), which pretty much sums up the method. The earthen oven is known as a huatia, and these days the main ingredient is often pork, lamb, mutton, or chicken, but traditionally it would be guinea pig or perhaps llama. The meat is always marinated in spices, and this may present a problem outside the Andes. They give the meat a unique flavor that cannot be replicated. So, when I give you a home recipe it comes with a warning: this is nothing like traditional pachamanca. Other Andean produce, such as potato, green lima beans, sweet potato, cassava or yuca, and humitas, as well as ears of corn, tamale and chile can all be included in the baking at cook’s choice. You can cook this on the stove top or in the oven. Cooking times will vary according to your choice of meat. Chicken can cook in about an hour, pork in a bit longer, and lamb longer still. Mix all the marinade ingredients in a non-reactive bowl. Marinate the meat and vegetables for 2 hours or longer in the refrigerator. (See my HINT tab). Marinating in a bowl will work will enough, but you have to keep turning the ingredients periodically. Layer the ingredients in a large flameproof casserole dish as follows: the 450 ml of water, meat, sweet potatoes, potatoes, and corn kernels. Top with the chopped huacatay (or cilantro), and add the marinade. Cover with the corn husks or a circle of baking paper, and cover tightly with a lid. Cook over low heat on the stove top or in a 300˚F oven. Cooking time will be determined by the choice of meat (2 hours will work for most meats). Make sure the casserole is tightly sealed throughout. Cut the chiles in half lengthways and remove the veins and seeds. Wash the chiles in water with a tablespoon of vinegar added. Repeat the washing several times, with fresh vinegar each time. Leave the chiles to soak in cold water for 5 hours. Drain the chiles and place in a saucepan, cover with water and add all the sugar. Bring to the boil, then reduce the heat and simmer for 8 minutes. Drain and then repeat the simmering process 5 times (but without sugar), changing the water each time. Drain the chiles, place in a blender and blend to a smooth paste. The paste can be refrigerated or frozen until ready to use. Heat the oil in a large, heavy skillet over a medium heat. Add the whole garlic cloves and sauté until very lightly browned. Set the garlic aside. Turn the heat under the skillet to low, add the onions and cook, stirring frequently until they are light brown. Transfer the onions, garlic, and oil to a blender and blend to a purée. Leave to cool, then cover tightly and refrigerate or freeze until needed.